Blackwater Lake: This small lake is located 25 km (15.5 mi) northwest of Donald Station off of Hwy #1. Fishing for rainbow and cutthroat trout is best from May through September at Blackwater Lake. Botts Lake: The lake is located 16 km (10 mi) west of Brisco off of Hwy #93/95. Botts Lake provides excellent fishery for cutthroat trout of up to 2.2 lbs. Cartwright Lake: Cartwright Lake is located 50 km (31 mi) north of Wilmer via the Frances Creek Road or by travelling west from Brisco. Rainbow trout are the game fish in Cartwright Lake. Cedar Lake: This small lake is located 8 km (5 mi) northwest of Nicholson via a good road. Rainbow trout averaging 2.2 lbs are readily caught during the spring at Cedar Lake. Cleland Lake: The lake is located 10 km (6.2 mi) west of Brisco via an access road off of Hwy #95. Trolling and flycasting for rainbow trout of up to 2.2 lbs are both productive methods used at Cleland Lake. Comfort Lake: This small lake is located 30 km (18.6 mi) northwest of Donald Station off of Hwy #1. Both rainbow and cutthroat trout provide good fly fishery particularily from May to September at Comfort Lake. Hall Lakes: These two lakes are accessed via the Frances Creek Road, 30 km (19 mi) north of Wilmer. Cutthroat trout are resident in these two lakes. Lake Koocanusa: The lake is located west of Hwy #3/93 with the best access being from Kikomun Creek Provincial Park. Whitefish and burbot are resident in Lake Koocanusa and Kokanee, yellowstone cutthroat and Gerrard strain rainbow trout are stocked here, all reaching good sizes. Lead Queen Lake: Lead Queen Lake is located 40 km (25 mi) north of Wilmer. Access is via the Frances Creek Road. Cutthroat trout are resident in Lead Queen Lake and caught easily with fly or baited hook. Mitten Lake: Mitten Lake is located approximately 15 km (9.3 mi) southwest of Parsons via logging road. Mitten Lake provides excellent fishery for rainbow trout and is stocked annually with the Gerrard strain rainbow trouts. 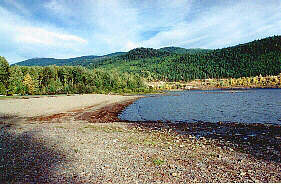 Moyie Lake: The lake is located off of Hwy #3, 20 km (12.5 mi) south of Cranbrook. Moyie Lake produces kokanee to 30 cm (12 in), rainbow and bull trout average3.3 lbs, eastern brook trout to 2.2 lbs and cutthroat to 1 lbs. Norbury Lake: An access road leads southeast from Fort Steele to Norbury Lake. Rainbow trout of up to 4 lb are not uncommon at Norbury Lake. North Star Lake: The lake is located west of Hwy #3/93 with the best access being from Kikomun Creek Provincial Park. Whitefish and burbot are resident in North Star Lake and Kokanee, yellowstone cutthroat and Gerrard strain rainbow trout are stocked here, all reaching good sizes. Premier Lake: Premier Lake is located northeast of Skookumchuk on Hwy #93/95 via 8 km (5 mi) of gravel road. This popular lake is stocked with rainbow trout reaching sizes of 4 lbs and brook trout are resident. Rosen Lake: Access to this lake is located southeast of Jaffrey off Hwy #3. Large populations of trout are stocked in Rosen Lake. Steamboat Lake: Located 30 km (66 mi) north of Wilmer via the Frances Creek Road. Trout average 2.2 lbs at Steamboat Lake. Susan Lake: The lake is located 20 km (44 mi) northwest of the community of Donald Station off of Hwy #1. Susan Lake provides good brook trout fishery. Suzanne Lake: The lake may be accessed from Hwy #3 near Jaffrey. Rainbow trout are large and abundant in the Suzanne Lake. Tamarack Lake: This small lake is located 5 km (3 mi) north and west of Skookumchuk. This small fly only lake is known for its rainbow trout fishery with species of up to 4 lbs. Tie Lake: The lake is located off of Hwy #3, 5 km (3 mi) north of Jaffrey. Smallmouth bass fishery in this lake is reported to be outstanding. Large rainbow trout and brook trout are not uncommon at Tie Lake. Wasa Lake: Wasa Lake is located 50 km (31 mi) north of Cranbrook via Fort Steele. Bass average 3.3 lbs and perch, 1 lbs at Wasa Lake. Whiteswan Lake: The lake is located 22 km (14 mi) east of Hwy #93/95 via a turnoff 10 km (6 mi) south of Canal Flats. Whiteswan Lake provides some of the best angling oppurtunity in the Kootenay region. Rainbow trout are stocked in the lake and weigh an average of 1 and 4.5 lbs with species of up to 17.6 lbs recorded. Whitetail (Deer) Lake: Whitetail Lake is located 35 km (22 mi)west of Canal Flats via the Findlay Creek Road. Rainbow Trout are resident in Whitetail Lake. Wilbur Lake: Turn west off of Hwy #95 at Parson and follow a rough logging road 10 km (22 mi). Wilbur Lake provides excellent rainbow fishery with species of over 2.2 lbs not uncommon.